Though it was previously better known for light industries and acres of rubber trees, the constituency of Segambut (prime area) is becoming increasingly residential, and as consequently increasingly elegant and exclusive, thanks to upscale developments such as Mont' Kiara and Sri Kiara. This does not mean that all of Segambut's neighbourhoods are enclaves of the rich. The majority, in fact, are more modest, ranging from middle-class communities to low-income housing estates and rural areas. These places also tend to have high immigrant populations. �Almost 50% of Segambut's residents are Chinese Malays, more so in the areas of Taman Sri Sinar and Taman Bukit Maluri. This smart expatriate enclave arose in the late 1980s when a property developer purchased 100 acres of the old Segambut Rubber Estate some kilometres west of the city centre, cleared the land, and built an exclusive housing development on it. 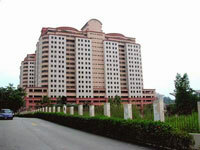 Mont' Kiara (or Mont' Kiara, as it is sometimes spelled) is centrally located in the Klang Valley. The urban centres KLCC and Petaling Jaya are just 15 minutes away by car. 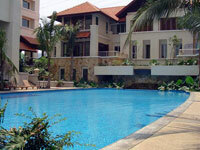 Mont' Kiara's high-rise condominiums and spacious bungalows are surrounded by rich greenery. They are near four international schools and several office buildings, banks, retail stores, and sports and leisure facilities, including a stadium, a horse-riding club and a golf course. This mixed-use development is home to expatriates from 30 or so nations, many of them from Korea and Japan, catered to by a growing number of Korean and Japanese shops and restaurants. Mont' Kiara also happens to be one of the few areas in Malaysia offering full broadband connection to offices and homes. Plaza Mont' Kiara's integrated business complex has a spa and fitness centre, supermarket, day care centre and several dining outlets. For a taste of Malay-style shopping, there's a weekly flea market, and a Thursday night market selling local handicrafts, clothing, household items, antiques, plants and food products including fresh fruits. Sri Hartamas ("glowing estates") is a high-end expat enclave near Mont' Kiara, with family villas and townhouses with landscaped gardens, public parks and broad avenues. Most foreigners here come from Europe, UK, Australia and Japan, mostly couples with young kids. The place also attracts young upper-middle-class Malaysians with small families. Sri Hartamas' road network is conveniently linked by three expressways to major points within Kuala Lumpur, such as the city centre. Despite its nearness to the urban centres, the area has a rural, laid-back charm, if somewhat pricey. The self-contained Sri Hartamas suburb has its own security, along with its own fire and police stations. By the entrance is the National Science Centre, and nearby there are various country clubs. The community has no clearly dominant ethnic group. Wireless and broadband Internet are available. Everything is within easy access, including private international schools. Residents can taste the finer pleasures of life in Petaling Jaya, which has restaurants of various culinary traditions from all over the world. Petaling Jaya's trendy nightclubs attract a youthful crowd, but the older crowd would enjoy the cosy cafes. The phrase "Taman Tun" refers to a place for titled folk. Usually referred to as TTDI, Taman Tun Dr Ismail is named after the former Deputy Prime Minister, Dr. Ismail, who was Malaysia's UN representative. Classy and quiet, TTDI's residential areas have well-planned low-density housing, with modern conveniences. Many of TTDI's residents are locals who grew up in the area, giving the place a hospitable, small-town energy that's friendly and welcoming to newcomers and visitors. Many used to be civil servants who worked at the nearby Jalan Duta government complex. TTDI has its own security patrols to supplement the work of the nearby police station, and to further curb crime in the area gates are being installed at the entrances to the neighbourhood. TTDI has good medical and dental facilities, public and private, aside from the nearby Damansara Specialist Centre. It has commercial outlets such as IKEA, Tesco, One Utama and The Curve shopping centres. Real estate developments here tend to be mixed-use, such as luxury flats with commercial components, although there are still a few plots of land available for residential projects. TTDI's upper-crust residents enjoy the convenience of living near KLCC and Bangsar, although TTDI has its own entertainment scene and shopping centres. Originally planned as a government housing venue, Damansara Heights became in time an exclusive neighbourhood, prized for its green and refreshing surroundings. A wonderfully scenic location, Damansara Heights is now one of Malaysia's most upscale locations. The old-money elite, including some of the country's most powerful people, rub shoulders here with well-heeled expatriates. They enjoy a superb natural environment, living in the midst of Klang Valley's remaining original rainforest area. 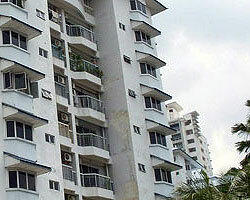 Damansara Heights is built on hilly terrain, overlooking the city, whose centre is just 5 kilometres away. 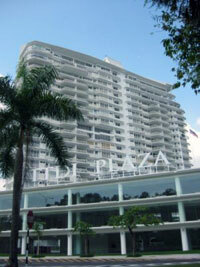 It is surrounded by the Jalan Beringin road, and the livelier Bangsar area is just five minutes away by car. There are lots of housing options, from magnificent mansions to low-density condominium buildings. For shopping, dining and entertainment, Bangsar is just a few minutes away by car. The commercial area of Medan Setia is a cosy business hub, which also has restaurants. For those who prefer their sports organized, there are the Bukit Kiara Sports Complex, the exclusive Bukit Kiara Equestrian and Country Resort, the Kuala Lumpur Golf and Country Club with its championship course, and an annex of the Royal Selangor Club. Near the golf course, 467 acres are being developed into a public park. However, the area is also increasingly the focus of development projects, due to the success of Mont' Kiara nearby. Bukit Kiara is also home to the Sime Darby Convention Centre, the National Science Centre (a domed building housing several galleries that exhibit advances in science and technology) and the Malaysian Securities Commission.